Like many of Blake’s separate graphics, “Enoch” offers several problems for those who wish to determine its exact medium, date, and the circumstances surrounding its production. Even the subject of Blake’s only known lithograph was not discovered until 1936.1↤ 1 Laurence Binyon and Geoffrey Keynes, introduction to Illustrations of the Book of Job by William Blake (New York: Pierpont Morgan Library, 1935), p. 8 of the first fascicle. The authors credit Joseph Wicksteed with the discovery that the inscription on the book held by the central figure is “Enoch” in Hebrew; the inscription on the tablet held by a floating figure on the right is “And Enoch walked with God” (from Genesis V:24). 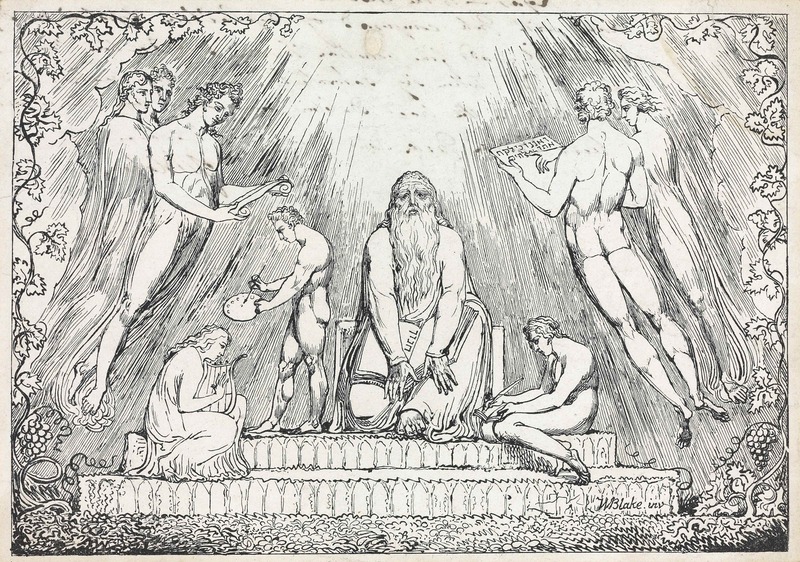 Previous authorities had believed that the design pictured “Job in Prosperity,” the title given to it by A. G. B. Russell in The Engravings of William Blake (Boston and New York: Houghton Mifflin, 1912), p. 91. The error is understandable because the design is closely connected with Blake’s development of a composition he also used in his Job illustrations, culminating in the lower half of the central design on pl. 2 of the Job engravings. Apparently some scholars have not been convinced by Wicksteed’s findings; S. Foster Damon, for example, describes the print as “‘Job in Prosperity’ . . . holding on his lap an open book labelled (in Hebrew) ‘Enoch’.” See Damon, A Blake Dictionary (Providence, R. I.: Brown University Press, 1965), p. 126. My purpose here is to review what we know about the techniques Blake used to create “Enoch” and present some new information on its relationship to the history of early lithography in England. The pen and ink inscription (illus. 1) on the verso of an impression of “Enoch” in the collection of Mr. Edward Croft-Murray (illus. 2) would seem to offer a description of how the print was made. The handwriting is George Cumberland’s, whose own involvement with graphic experiments, and in particular with Blake’s plans to publish an account of his inventions,2↤ 2 Letters between Cumberland and Blake of 1807-1808 and several entries in Cumberland’s journal indicate that the two friends were discussing the publication of Blake’s “new Mode of Engraving.” See Geoffrey Keynes, ed., The Letters of William Blake (London: Rupert Hart-Davis, 1968), p. 134; and G. E. Bentley, Jr., Blake Records (Oxford: Clarendon Press, 1969), pp. 187-88, 211 and n. 3, 212. lends some authority to the inscription. Mr. Croft-Murray tells me that the print appeared in a Sotheby’s auction in 1957 as part of a miscellaneous lot that included a number of Italian engravings that were probably from Cumberland’s extensive collection of such material. Cumberland probably acquired his “Enoch” directly from Blake, and his description on its verso may very well be based on Blake’s own account of how he made the print, as the last two words of the note indicate. The inscription reads as follows: ↤ 3 The inscription was first published on the verso of a single sheet of “Additional items on exhibition, 13 January–28 March 1971,”[e] a supplement to William Blake: Catalogue of the Collection in the Fitzwilliam Museum Cambridge, ed. David Bindman (Cambridge: Heffer and Sons, 1970). The text printed here is a new transcription from the original (see also illus. 1). If we assume the general accuracy of Cumberland’s account, the “Block” or stone was white lias, a limestone from an area near Bath in southwestern England, rather than the German Kellheim stone used by Alois Senefelder in the lithographic process he invented in the mid-1790s.4↤ 4 See Senefelder, Complete Course of Lithography (London: R. Ackermann, 1819), for a full description of the process and its invention. The use of white lias for lithography was first suggested in print by John Thomas Smith, Antiquities of Westminster (London: J. T. Smith, 1807), p. 48. Charles Hullmandel, The Art of Drawing on Stone (London: Hullmandel and R. Ackermann, ), p. 2, warns that “the white lias, of Bath . . . is too soft and porous” for lithography. Michael Twyman, Lithography 1800-1850 (London: Oxford University Press, 1970), p. 30, asserts that Blake subscribed to Smith’s Antiquities; but in fact the “William Blake, Esq. Sunbury House, Middlesex” in Smith’s List of Subscribers, p. 274, is not the eponym of this journal. Instead of using lithographic chalk or ink, Blake drew his design with a mixture of asphaltum and linseed oil which, if not the acid resist he actually used in his copperplate relief etchings, must have been a liquid with very similar physical properties. Besides the chemical differences between this mixture and lithographic ink,5↤ 5 Senefelder, pp. 111-18, offers several formulae for his “chemical ink.” Most require wax, soap, shellac, and lampblack (for color). The “soft” ink “for transferring Drawings or Writings from Paper on the Stone” (pp. 121-22) is a less viscous variant of the chemical ink. For what we know of the acid resist Blake used for his relief etchings, see Essick, William Blake, Printmaker (Princeton: Princeton University Press, 1980), pp. 87-88. Blake’s material was probably more glutinous and would have to be heated so as to flow evenly from the brush or pen and harden quickly upon contact with the cool stone. According to Cumberland’s note, Blake added “Tripoli” and/or rotten stone, both fine polishing compounds, to his resist, perhaps simply as a thickener or to increase the receptivity of the resist to printing ink. At this point, the usual procedure in early nineteenth-century lithography, at least as practiced in England, would have required a lithographic etch, water wash, and gum-water treatment to increase the stone’s ability to hold water and repel ink. The first of these procedures actually reduced the surface of the stone wherever it was not protected by the lithographic ink or chalk, which functioned like the ground or acid resist in copperplate etching. Although he later realized that the proper inking of the stone depended almost completely on the antipathy of the oily printing ink to the water-soaked stone, Senefelder states in his Complete Course, p. 10, that he etched his early stones to a depth of “about a 10th part of a line, (or 1-120th part of an inch).” That this practice was continued in early English lithography is indicated by Thomas Fisher who notes, in the Gentleman’s Magazine of begin page 181 | ↑ back to top 1808, that “that part of the face of the stone not actually covered with the ink is lowered about the thickness of half a line [i.e., about 1/24 of an inch? ].”6↤ 6 Senefelder, p. 10; Fisher, “The Process of Polyautographic Printing,” Gentleman’s Magazine, 78 (March 1808), 194. Thus, “polyautography” (as early lithography was called) was a relief process and not a true planographic technique like modern lithography. If Cumberland did not accidently leave these steps out of his description, then Blake’s method required neither etching nor gumming-up and he added only water to repel the printing ink from the uncovered surface of the stone. The foreshortening of the conventional procedure may have been possible because Blake’s asphaltum and linseed oil resist would itself raise the image above the level of the stone. Asphaltum will solidify at a slightly higher level than any smooth surface to which it is applied.7↤ 7 I have found it quite easy to print from varnish delineations on unetched surfaces; see Essick, William Blake, Printmaker, pp. 110-11 and fig. 109. Printing from asphaltum and linseed oil would be the same as long as the mixture were allowed to harden thoroughly. Finally, Blake inked the stone with a “broad Dabber,” which must have been a large type-printer’s inking ball of the sort generally used in early English lithography,8↤ 8 Smith, Antiquities of Westminster, p. 50. and printed the stone “as a block”—that is, in relief like a woodcut or one of Blake’s own copperplates for his illuminated books. If we can trust Cumberland’s intriguing inscription, “Enoch” was produced by a hybrid technique combining the stone and water elements of early lithography with an acid resist very similar, perhaps even identical, to that used by Blake in his own relief etchings. The awkward execution of some passages in the design (note, for example, the two faces upper left) may be the result of the experimental nature of the medium and Blake’s unfamiliarity with working on a stone that was far more porous than his copperplates. It is even possible that Cumberland played a role in the preparation of the stone; similar types of gracelessness of line and stiffness in the figures appear in the outline engravings (or perhaps simply drypoint sketches) he made for his Thoughts on Outline (1796). It must be admitted, however, that Blake’s own work, particularly drawings executed in the 1780s, is not free from such features. A. G. B. Russell, Laurence Binyon, and Sir Geoffrey Keynes have all associated the execution of “Enoch” with the lithographic publishing endeavors of Georg Jacob Vollweiler.11↤ 11 Russell, Engravings of Blake, p. 91; Binyon, The Engraved Designs of William Blake (London: Ernest Benn, 1926), pp. 21-22; Keynes, Engravings by William Blake: The Separate Plates (Dublin: Emery Walker, 1956), pp. 43-44. None of these authorities gives any specific reasons for believing that Vollweiler had something to do with “Enoch.” Late in 1800, Senefelder came to England and patented his new process of polyautography.12↤ 12 The historical facts recounted here are taken from Senefelder’s Complete Course, Twyman’s Lithography, pp. 26-40, and Felix H. Man, “Lithography in England (1801-1810),” in Prints, ed. Carl Zigrosser (New York: Holt, Rinehart and Winston, 1962), pp. 97-130. He brought with him Philipp André, to whom Senefelder had taught the new process. When he returned to Germany after a visit in England lasting about seven months, Senefelder sold the patent to André, who stayed in London. In 1803, André issued Specimens of Polyautography containing twelve lithographs by various English artists, including Barry, Stothard, and Fuseli. When André left London in 1805, Vollweiler took over as patentee. He reissued Specimens, adding to it twenty-four new prints, with a title-page dated 1806 but with some prints inscribed 1807 on the stone. Like the first issue, Vollweiler’s publication attracted little notice, and he returned to Germany in August 1807. His lithographic equipment passed into the hands of D. Redman, who removed the business to Bath in 1813. But “Enoch” was not published as part of either issue of the Specimens.13↤ 13 Fisher, Gentleman’s Magazine, p. 195, lists the artists who contributed to the Vollweiler issue, and Blake is not among them. The best known impression of “Enoch” is the one in the British Museum, Department of Prints and Drawings, bound into a volume containing many Specimens prints, but also containing a number of lithographs not published in Specimens. No impression of “Enoch” is mounted on paper with a brown aquatint border, as are all the prints actually issued in the Specimens, 1803 and 1806. Indeed, Cumberland’s description of Blake’s experimental procedures would seem on the face of it to dissociate his work from the entire Senefelder-André-Vollweiler enterprise. It seems improbable that the inventor of lithography or his official successors in London would sponsor a project that did not follow normal lithographic procedures on which they held the patent. The special properties of Kellheim stone would logically have been one of the keys to their secret, patented process, and the substitution of another, locally obtainable stone something that the patentees would eschew. This is the line of thinking I set forth in my previous comments on “Enoch,”14↤ 14 In William Blake, Printmaker, pp. 161-63. While I am on the tedious subject of correcting my own errors, let me point out that fig. 4 in Printmaker, a detail from “View of St Peter’s Church” after Thyne O’Niell, was not engraved by Blake’s master, James Basire (1730-1802), but by his son and successor of the same name (1769-1822). My error was caused by a pencil inscription on the verso of a trimmed impression in my collection indicating that the print was produced c. 1775, and thus necessarily by the elder Basire. However, Professor Christopher Heppner has very kindly pointed out to me that the print appears on the Oxford Almanack of 1809. The whole design, much reduced, is reproduced in Helen Mary Petter, The Oxford Almanacks (Oxford: Clarendon Press, 1974), p. 84, where it is noted that the painting was commissioned from Hugh O’Neill (who apparently also used the name “Thyne O’Niell”) in 1806. Thus the plate must be by the younger Basire. My purpose in reproducing a detail from it in Printmaker was to show typical features of the senior Basire’s style, particularly twisted lines on rounded forms and worm lines in landscapes, later used by Blake. The first technique can be found in just about any arm or leg delineated by Blake’s master; the worm lines appear in a number of his book illustrations—see for example James Stuart and Nicholas Revett, The Antiquities of Athens, vol. I (1762), pl. 1; Vetusta Monumenta, vol. II, pl. 24 (“View of Richmond Palace” dated 1765); Jacob Bryant, A New System, or, an Analysis of Ancient Mythology (1774-76), vol. I, pls. 2, 3, 7, vol. II, pl. 1 (lower left in the upper panel); Archaeologia, vol. III (1775), pl. 17 facing p. 315; Richard Gough, Sepulchral Monuments in Great Britain (1786), pl. 14 facing p. 42. Some of these examples are very close to the worm lines in plates by the younger Basire and by Blake, although both may have been directly influenced by William Woollett’s practices. Woollett was famous for his use of heavy worm lines, or “needling,” and was apparently much admired by the senior Basire since he gave his son Richard the middle name of Woollett (see Printmaker, pp. 199-200). but some new evidence I have come upon indicates a very different conclusion. Several crucial, if not absolutely conclusive, pieces of evidence do link “Enoch” to Vollweiler’s activities. 1 Pen and ink inscription by George Cumberland on the verso of an impression of Blake’s “Enoch” lithograph (illus. 2). The mat covers a few letters on the far right. 2 Blake’s “Enoch.” Modified lithograph, 1806 or early 1807. 21.7 × 31 cm. The marks in the white space above the central figure are letters of the inscription (illus. 1) showing through from the verso. Collection of Mr. Edward Croft-Murray; reproduced with his permission. begin page 183 | ↑ back to top the stone on loan at a moderate price.”15↤ 15 “Lithography in England” in Prints, p. 108. Man does not give the source of his information or the whereabouts of copies of these “circulars.” Thus, Vollweiler may have provided stones to artists who, like Blake, had little contemporary fame and thus would not have been asked to contribute to Specimens. And these artists of little consequence would have been the very sort to be given the somewhat inferior white lias rather than the imported, and probably much more precious, Kellheim stones. The papers on which three of the four extant impressions of “Enoch” are printed suggest a further connection with Vollweiler. The print in the British Museum is on the same type of buff colored wove paper, and both the image (21.7 × 31 cm.) and the sheet (22.6 × 31.9 cm.) are of about the same size, as several of the Specimens prints, second issue, bound with it. The chocolate brown wove paper on which the copies in the collections of Sir Geoffrey Keynes and Raymond Lister are printed is similar in color and texture to the stock used for the chalk manner lithographs in P. E. Stroehling’s Original Sketches Drawn Upon Stone, published by Vollweiler shortly before he left London, and for the prints in Twelve Views in Scotland, Delineated by a Lady [F. Waring] in the Polyautographic Art of Drawing Upon Stone, published by Rudolph Ackermann in 1803.16↤ 16 Five of the Stroehling lithographs on brown paper are in the British Museum. In 1803, Ackermann could only have learned of lithography from André, who very probably also provided Ackermann with the stones and pulled the impressions. For a reproduction of the Keynes’ impression of “Enoch” on a brown background slightly lighter than the tone of the original paper, see Keynes, Engravings by Blake: The Separate Plates, Pl. 26. I know of no other prints by Blake, executed in any medium, printed on these unusual types of paper. Finally, a standard plate printing press of the early nineteenth century could only have been adapted for lithographic printing with considerable difficulty because of the thickness of the stone. In all probability, Blake would have had to turn to someone with the requisite equipment to pull good quality impressions from his stone. The only people in England so equipped until 1812 were André, Vollweiler, and Redman.17↤ 17 According to Twyman, p. 34. Mann, p. 112. states that “Enoch” is “clearly recognizable as a Vollweiler print,” but does not say why. Thus, the preponderance of the evidence suggests that Blake learned of lithography from Vollweiler, rented or borrowed the stone from him, delineated “Enoch” in an acid resist similar to the liquid he had used for years for his relief etchings, and returned the stone to Vollweiler for printing. The first three of these steps could have occurred only in 1806 or early 1807, after Vollweiler had taken over the London lithographic business from André and before he departed for Germany. The printing could have been done by Redman at a later time, but it would have been to the economic advantage of all concerned to proof “Enoch” shortly after its execution and remove Blake’s work from the stone so that it could be used again for another drawing. Blake could not have learned about Senefelder’s inventions until a good many years after he had developed his own methods of relief etching on copper. Even the most sophisticated manipulations of relief etching and its integration with white-line etching/engraving are displayed as early as 1793 in America. Yet Blake must have been very interested in whatever he could learn about lithography from Vollweiler or other practitioners since early polyautography was so similar, in its essential relief-etched characteristics, to his own techniques. The plans to publish an account of Blake’s inventions (see my note 2) may have been stimulated by his learning about rival techniques such as Senefelder’s etching on stone and Lizars’ etching in relief on metal or stone. Blake might have learned something from contacts with Vollweiler that he could apply to his own copperplate methods, although there is no evidence for this in Blake’s relief etchings after 1806-1807. Senefelder had developed a method of transferring a text or design written in lithographic ink from gummed paper to a stone,18↤ 18 See Senefelder, Complete Course, pp. 121-22, 169-71, 256-64. and Vollweiler may have known about this technique. This was most useful to artists who, unlike Blake, were not professional engravers and thus were not proficient at writing or designing with right and left reversed. I very much doubt that Blake needed to use a transfer technique; if he did, he must have invented it independently some years before his contacts with Vollweiler. Although lithography’s influence on the illuminated books could only have been minimal and late, “Enoch” does provide a unique point of indirect contact between William Blake and Alois Senefelder, two of the greatest innovators in the graphic arts.